What is driving this technology recycling is data. According to HPE CEO, Antonio Neri, “Data is the new intellectual property, and companies that can distill intelligence from their data—whether in a smart hospital or an autonomous car—will be the ones to lead.” The fusion of AI and machine learning is creating a tidal wave of data that is overwhelming traditional architectures. The 90’s classic rock song, “Living on the Edge” proclaimed, “We’re seeing things in a different way.” Nothing could be more true when it comes to the modern day WAN. So much of your data is living on the edge. The question is what you are going to do about it? As an enterprise IT manager, you probably delineate your job role to be someone that supports users and the network environment they require to perform their jobs. If so, you are only half-right. You need to include machines also. All of those endless IoT devices such as cameras and sensors that are populating the edge of enterprises everywhere need attention and resources, just like users. These devices do one thing, and do it very well—they produce vast amounts of data. In turn, they also require a different network environment. In the same way that the number of users dramatically expanded and pushed computing to the edge with the use of PCs and mobile devices, the technology cycle now repeats itself once again as billions of IoT devices are pushing computing even further to the edge. The concept of edge computing is nothing new, but machines, not users, are now dominating the edge. While the cloud is serving as the collector and processor for consumer IoT, it is simply impractical for enterprise and industrial IoT, otherwise referred to as IIoT. Smart home gizmos do not require dedicated network environments as they create a fraction of the data as their enterprise counterparts. Consumer IoT is limited to online communication with the cloud, while enterprise IoT can involve peer-to-peer traffic as well. The increasing numbers of big-data workloads and the rise of real-time computing have slowed production in the cloud; conventional architectures have been unable to meet future demand. Edge computing is coming to the rescue. Connected data, not isolated data, is what has value today, data in which insights can be derived from as close to real time as possible. Edge computing addresses this data paradigm. It is an analytical approach in which data is analyzed and processed close to its source rather than sending raw data to a central processor by default. It involves the placement of small batches of servers locally rather than concentrating the entire fleet in remote data centers. An example of this architecture is shown below. To compete today companies need business IT solutions that will drive the insights needed to innovate. Edge Computing is driven by mobile and the dependence on data hungry algorithm-based applications that shine light on new opportunities, and also undiscovered limitations that hinder optimal performance. In a globally competitive world driven by data, companies cannot always wait for data to travel across the internet to be batched processed at a central store. 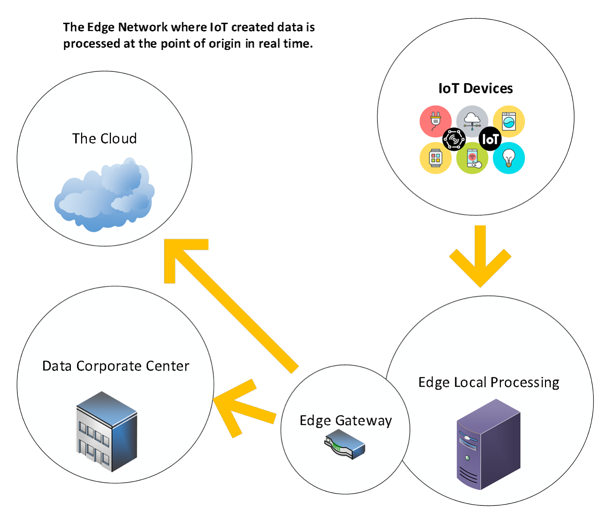 Edge analytics allow organizations to leverage their IoT devices to act on new insights within milliseconds. Bandwidth is expensive, so by performing analytics at the point of the origin, the necessity for communicative bandwidth between IoT sensors and the central data store is significantly reduced. Data can thus be generated in environments in which resources may not be continuously connected to a network. Edge Computing reduces workloads that used to be processed inside 24/7 cloud computing systems. This in turn increases the efficiency of computing and data applications that reside in the cloud or central store. All of this is why IDC analysts predict that spending on edge computing will become 18 percent of IoT infrastructure expenditure spending by 2020. From a business perspective, the beneficial allure of edge computing is obvious—those companies that can extract the right insights at the right time and place stand to gain significant advantages over their competitors. In a competitive marketplace in which potential disruptors (of any size) can be introduced at any time, understanding your customers is imperative. Being close to the customer is vital today, and edge computing is about processing data as close to the end-user as possible. From a technology perspective, there are several distinct advantages to taking it all to the edge. Speed is of the essence for industries that rely on services that can respond quickly to data in real time. Take the obvious example of an autonomous vehicle or drone. These machines that rely on machine learning and constant data crunching cannot rely on device-to-cloud round trips. But it’s not just about mobility. IoT devices that reside at production facilities may require computer vision or machine learning to help drive processes. Another example could be a manufacturer using machine learning-based defect detection that requires low-latency results—without sending data out of the facility. Security and compliance are top priorities in a data driven world. The privacy of sensitive data that exits your enterprise introduces serious security and compliance challenges. Job one is to protect your data. While some industries have not been able to take full advantage of the cloud due to compliance requirements, edge computing provides organizations the ability to process data onsite. Sensitive data can be filtered and retained while non-sensitive information can be forwarded to the cloud for further processing. When data resides everywhere, it can be created in problem areas where network connectivity is unreliable or intermittent. When data analytics is conducted at the place of origin, applications are not disrupted due to connectivity issues. This makes applications and data driven services more responsive and robust. By implementing Edge Computing and SD-WAN technologies, companies can select which services run at the edge and what data is sent to the cloud. This interjects greater agility and flexibility that helps maximize value throughout all areas of the enterprise, thus lowering bandwidth and IoT costs. 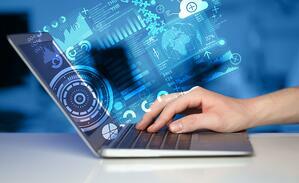 All of this plays into the hybrid IT models that enterprises are embracing today. Companies are recognizing these and other benefits of edge computing. According to the 2018 AFCOM State of the Data Center Industry Study, 44 percent of respondents stated that they have already deployed some form of edge computing capacity or will be doing so over the next 12 months. Another 17 percent already have it in their plans for the next three years. STAY TUNED: This is part 1 of our Edge Computing blog series. Catch part 2 next Tuesday, "Are you Ready for the Intelligent Edge?"